For 15 years, A1 Regal Marquees has built up a reputation as one of the best marquee providers in Yorkshire and now, with a growing fleet of styles and designs, the company continues to provide the best products at the best prices around. With the wedding season coming up, why not plan ahead and order your marquee from A1 Regal Marquees. Not only can they assist in the selection of that perfect venue accessory but also, due to their vast experience in the wedding industry, suggest tens of extra ideas, which no couple should overlook. Whether you are having an intimate dinner party or a wedding celebration, A1 Regal Marquees can cater for your every need with an array of marquees on offer. From 40 up to 200 people. Stand alone or wall-to-wall designs are available to meet every person's specification with added accessories available upon request. Hard flooring, linings, tables and chairs, all help furnish the inside of the marquee, providing an elegant finish whilst heating equipment is also available for the colder days and nights. All marquees are made of lacquered white PVC and conform to British Standard specifications, developed to withstand up to 60mph winds. 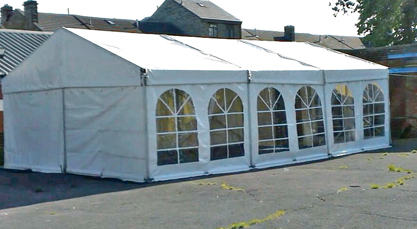 Marquees can even be erected on uneven land or hills, with the guarantee that they will remain strong in difficult conditions. The company has helped many people with difficult surface areas. Whether you are a person of small means or millions; the company tries to assist everyone. To continue to help their clients the firm is still investing in new, bigger marquees, furniture, décor and flooring. They also respect all their clients and their views and will always go out of their way to make their occasion a success. 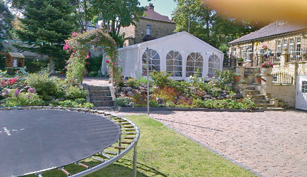 Contact A1 Regal Marquees today for expert advice on marquee and best prices. or call 07890 797 108.